The Bible speaks of joy, laughter and love in hundreds of places. Jesus said that He came so that we could live life and live it abundantly. The older I get, I realize that joy is really quite uncomplicated; it can be a feeling, yes – but I have found that true joy comes not from a feeling but from a fact – which is the truth of God’s love and saving grace in our lives. When we use our lives to serve others, and in the process, serve Him – well then that is the joy that comes though living an abundant life. My sister and brother-in-law have a family member who is a priest. He is a very gentle man with a good sense of humour who always brings a touch of interest to family gatherings. Recently, he and several of his brothers came to her house for an impromptu visit. They are Capuchin friars, which is a Franciscan order – dedicated to serving their community at large. All of them are highly educated and equally committed to sharing the Love and Joy of Jesus Christ through ACTIONS and WORDS. In fact they have given their lives and lifestyles to do just that. Though I know not everyone is called to be a friar; I just love that these men have chosen to use their lives as a mission for others. Though it flies against the narcissistic “it is all about me” relativistic mentality of the 21st century – they are able to find joy – true joy, in their choices. that picture looks a tad dodgy..
” CHILDREN !!! …… KEEP AWAY !!!! ” ??? I am not sure what is dodgy about it. Just a few folks having fun! Thanks for the feedback though. roman catholic monks ‘ playing on a child’ s toy !! 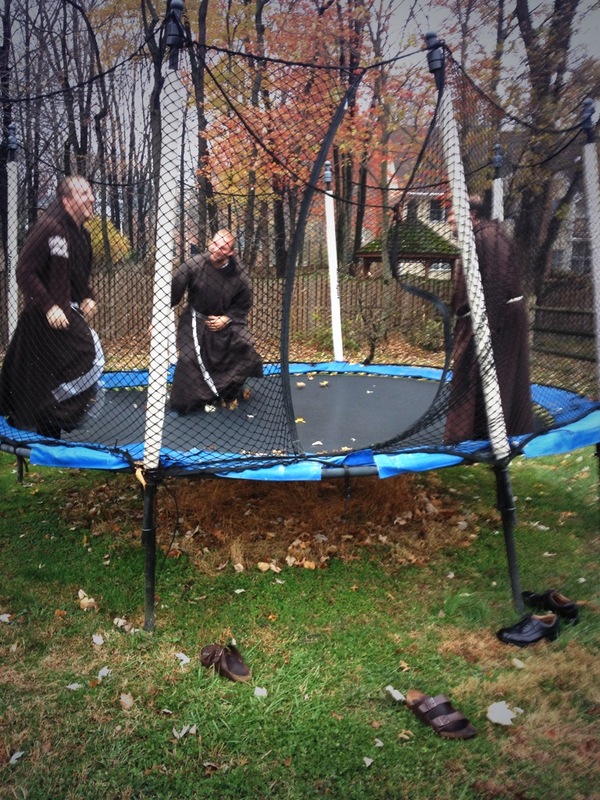 I find it refreshing that the friars have such an open attitude about having a little fun. Jesus wants us to live joyfully, it is good for others to see life lived abundantly in those who love Him! Thanks again for your thoughts;) have a beautiful Lord’s day (Sunday)!